I am remiss in not keeping you up-todate on the results of my trip to Romania. I had a truly blessed experience. I did work hard and accomplished a lot. I am enclosing some photos to show some of the work. I arrived in Budapest, Hungry Friday noon 9March. My first anxious moment is looking for my ride. They were right outside the entrance to the airport. We drove about five hours to Oradia. I met Florin, the Headmaster for the Bible College, whom I would spend most of my time interacting with. He took me to the small hotel on the edge of town where I was to stay for the next week. I had a light dinner then went straight to bed. Saturday we spent looking at the site and several building examples they were very interested in duplicating. They were very much interested in a campus type plan. They have a long and skinny site. Brother Cameron Wilson, the person who invited me to work in Romania came to Oradia from Bucharest about 9:00. Sunday was a full day of worship. I was asked to preach at the first service, then joined a group of English speaking folks for worship in the mid afternoon. I took a brief nap then off to evening services. Monday I interviewed the staff to further understand their wants and needs. By lunch time I was involved in the design effort. Their desire a school that consists of 5 dormitories each housing 20 persons, a dining hall with kitchen, a multifunction space for gym, chapel and larger gatherings, a residence for the administrator, four apartments for guests, a classroom building with offices for the staff and a library. In the middle of all this the pastor of the church which currently houses the School requested that I design an addition to their church. So I added that to my list. I made my initial presentation to the Director Wednesday evening. First thing Thursday morning he provided some feedback. I made the changes on Thursday and made a presentation to the entire faculty and student body on Friday morning. Saturday Cameron and I took the long train ride to Bucharest where we spent the weekend. I left early Tuesday morning. My next step is to provide the School with a set of working drawings for the Dormitory Units. I will plan to have them complete by mid summer. Thank you all for your help and prayers. It was a blessed event and a lot was accomplished for the Lord. David Bradshaw, a civil engineer, and I leave May 19 for Nicaragua to help Orphanetwork in masterplanning an orphanage in that Country. May God continue to bless each of you. THE TOP PICTURE IS THE PRESENTATION TO THE FACULTY AND STUDENTS IN THE AUDITORIUM OF THE CHURCH THAT CURRENTLY HOUSES THE SCHOOL. 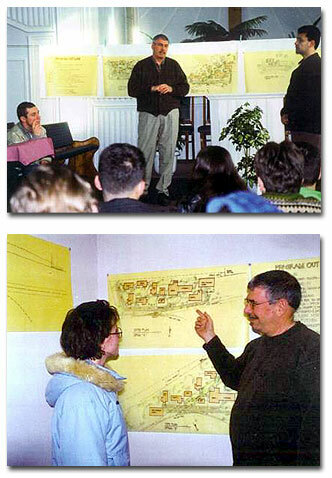 THE LOWER PICTURE IS MORE OF THE PRESENTATION TO ONE OF THE FACULTY IN THE OFFICE DAVID KLEMT WAS ASSIGNED TO WORK. THE UPPER PICTURE IS WITH DAVID KLEMT AND CAMERON WILSON AS THE CONCEPTS WERE PRESENTED TO THE FACULTY AND STUDENT BODY. 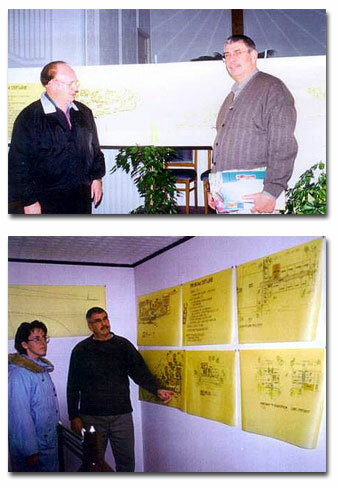 THE LOWER PICTURE SHOWS THE DRAWINGS IN THE OFFICE DAVID KLEMT WAS ASSIGNED. DAVID IS PRESENTING THE CONCEPTS TO ONE OF THE STAFF MEMBERS.